"New Orleans" and "The Big Easy" redirect here. For other uses, see New Orleans (disambiguation) and The Big Easy (disambiguation). Nickname: "The Crescent City," "The Big Easy," "The City That Care Forgot," "504," and "NOLA" (acronym for New Orleans, LA). The population of the city doubled in the 1830s, and by 1840 New Orleans had become the wealthiest and third-most populous city in the nation. It had the largest slave market. Two-thirds of the more than one million slaves brought to the Deep South arrived via the forced migration of the internal slave trade. The money generated by sales of slaves in the Upper South has been estimated at fifteen percent of the value of the staple crop economy. The slaves represented half a billion dollars in property, and an ancillary economy grew up around the trade in slaves - for transportation, housing and clothing, fees, etc., estimated at 13.5 percent of the price per person. All this amounted to tens of billions of dollars during the antebellum period, with New Orleans as a prime beneficiary. A view across Uptown New Orleans, with the Central Business District in the background (1991). Throughout the 20th Century, New Orleans experienced a significant drop in economic activity compared with newer southern cities such as Houston and Atlanta. While the port remained important, automation and containerization resulted in fewer local jobs for locals at the ports. Manufacturing in the city also diminished. New Orleans became increasingly dependent on tourism as an economic mainstay. Poor education and rising crime became increasingly problematic in the later decades of the century. The New Orleans cityscape as of 2007. In 2006, Louisiana voters overwhelmingly adopted an amendment to the state's constitution to dedicate all revenues from off shore drilling to restore Louisiana's eroding coast line. Congress has allocated $7 billion to bolster New Orleans' flood protection. Prior to Katrina in the Greater New Orleans Area, there were 265 hotels with an inventory of 38,338 rooms. In May 2007, there were over 140 metro area hotels and motels in operation with over 31,000 rooms in inventory.. The city is also host to the World Cultural Economic Forum (WCEF). The Forum, held annually at the New Orleans Convention Center, is directed towards promoting cultural, economic development opportunities through the strategic convening of cultural ambassadors and leaders from around the world. The first WCEF is scheduled to take place in October of 2008. Saint Louis Cathedral is a symbol of New Orleans. New Orleans has a high violent crime rate. Homicides peaked at 421 in 1994, a rate of 86 per 100,000 residents. The homicide rate rose and fell year to year throughout the late 1990s, but the overall trend from 1994 to 1999 was a steady reduction in homicides. From 1999 to 2004, the homicide rate again increased. New Orleans had the highest homicide rate of any major American city in 2002 (53.3 per 100,000 people) and again in 2003 (275 homicides). It should be stated that the number of homicides has decreased since 1994 - the number of homicides in 2004 was about 275, cutting the 1994 count by one-third. After Hurricane Katrina, media attention focused on the reduced violent crime rate following the exodus of many New Orleanians. Conversely, a number of cities that took in Katrina evacuees had a significant increase in their murder rate. Houston, for example, had a 25% increase in murders from the previous year. Captain Dwayne Ready stated, "We also recognize that Katrina evacuees continue to have an impact on the murder rate." Police have not kept records of how evacuees have affected crime rates other than homicide. As more residents return to New Orleans, the trend is starting to reverse itself, although calculating the homicide rate remains difficult given that no authoritative source can cite a total population figure. There were 22 homicides in July 2006, the same as the monthly average for the city from 2002 until Hurricane Katrina. There were 161 homicides in 2006. Hurricane Katrina destroyed the power lines supplying the St. Charles Avenue line. The associated levee failures flooded the Mid-City facility storing the red streetcars which normally run on the Riverfront and Canal Street lines. Restoration of service has been gradual, with vintage St. Charles line cars running on the Riverfront and Canal lines until the more modern red cars are back in service; they are being individually restored at the RTA's facility in the Carrollton neighborhood. On December 23, 2007, streetcars were restored to running on the St. Charles line up to Carrolton Avenue. The much-anticipated re-opening of the second portion of the historic route, which continues until the intersection of Carrolton Avenue and Claiborne Avenue, was commemorated on June 28, 2008. Natural gas and electricity dominate the home heating market with similar market shares totaling about 47 percent each. The Big Easy was possibly a reference by musicians in the early 20th century to the relative ease of finding work there. It also may have originated in the Prohibition era when the city was considered one big speak-easy due to the inability of the federal government to control alcohol sales in open violation of the 18th Amendment. The term was used by local columnist Betty Gillaud in the 1970s to contrast life in the city to that of New York City. The name also refers to New Orleans' status as a major city, and at one time "one of the cheapest places in America to live" and came into popular usage throughout the United States in the wake of the 1987 film The Big Easy, which was set in New Orleans. The City that Care Forgot was given by American writer Mark Twain, and refers to the outwardly easy-going, carefree nature of many of the residents. The Northernmost Caribbean City is a reference from the Boston Globe as well as other travel guides due in part to the similarities of culture with the Caribbean islands. New Orleans in Fiction, Film, Television, etc. ^ "Table 1: Annual Estimates of the Population for Incorporated Places Over 100,000, Ranked by July 1, 2006 Population: April 1, 2000 to July 1, 2006" (CSV). 2005 Population Estimates. United States Census Bureau, Population Division (2007-06-28). Retrieved on 2007-06-28. ^ a b ""Orleans Parish History and Information"". Retrieved on 2008-03-18. 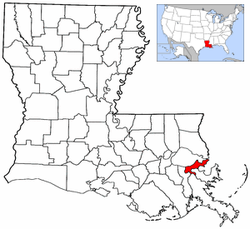 ^ "Louisiana Parish Map with Administrative Cities". Retrieved on 2008-03-18. ^ a b "Home Rule Charter of the City of New Orleans as amended through January 1, 1996" (1996-01-01). Retrieved on 2008-03-18. ^ Cultures well represented in New Orleans' history include African American, Creole, Cajun, French, German, Irish, Italian, Jewish, Latino, Spanish, and Vietnamese. "Multicultural History". Retrieved on 2008-04-26. ^ a b "New Orleans: The Birthplace of Jazz" (primarily excerpted from Jazz: A History of America's Music). PBS – JAZZ A Film By Ken Burns. Retrieved on 2006-05-17. ^ "America Savors Its Music During Jazz Appreciation Month". U.S. Dept. of State – USINFO. Retrieved on 2006-05-17. ^ "History of Les Gens De Couleur Libres". Retrieved on 2006-05-17. ^ "The Ustica Connection". Retrieved on 2008-03-22. ^ Kusky, Timothy M. (2005-12-29). "Why is New Orleans Sinking?". Department of Earth and Atmospheric Sciences , Saint Louis University. Retrieved on 2006-06-17. ^ O'Hanlon, Larry (2006-03-31). "New Orleans Sits Atop Giant Landslide", Discovery Channel. Retrieved on 2006-06-17. ^ Marshall, Bob (2005-11-30). "17th Street Canal levee was doomed", Times-Picayune. Retrieved on 2006-03-12. ^ "Deaths of evacuees push toll to 1,577". nola.com. Retrieved on 2008-03-22. ^ "Mayor: Parts of New Orleans to reopen". CNN.com (September 15, 2005). Retrieved on 2006-05-02. ^ "N.O. head count gains steam", Times-Picayune, August 9, 2007. Retrieved August 14, 2007. ^ "New Orleans Braces for Convention Comeback". Retrieved on 2008-03-23. ^ "New Orleans Convention and Visitors Bureau". Retrieved on 2008-03-23. ^ "New Orleans and Major League Soccer?". ABC26 News. Retrieved on 2007-08-26. ^ "US Gazetteer files: 2000 and 1990". United States Census Bureau (2005-05-03). Retrieved on 2008-01-31. ^ "United States Summary: 2000" (pdf) 165. United States Census Bureau (2004-04-01). Retrieved on 2008-03-31. ^ a b Barry, J.M.. "What You Need to Know About Katrina-- and Don't-- Why It Makes Economic Sense to Protect and Rebuild New Orleans.". Retrieved on 2007-12-11. ^ Strecker, M. (2006-24-07). "A New Look at Subsidence Issues". 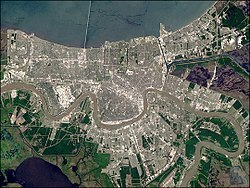 ^ Williams, L. Higher Ground - A study finds that New Orleans has plenty of real estate above sea level that is being underutilized. The Times Picayune, April 21, 2007. ^ New Orleans People, Pets Flee Flood (photographs). From: National Geographic, August 30, 2005. ^ "Monthly Averages for New Orleans, LA". Retrieved on 2006-08-06. ^ "The Weather Channel's Special Report: Vulnerable Cities - New Orleans, LA". Retrieved on 2006-10-26. ^ Overseas visitors to select U.S. cities/Hawaiian Islands 2001 - 2000. U.S. Department of Commerce, Office of Travel and Tourism Industries. Retrieved November 12, 2007. ^ Louisiana Department of Culture, Recreation, and Tourism. "2006-07 Marketing Plan". Retrieved on 2008-03-22. ^ "Travel + Leisure says New Orleans is tops for live music, cocktails and cheap eats". NOLA.com (2007-10-10). ^ "Blanco okays Broadway South tax credit program". Retrieved on 2007-03-23. ^ a b Huey, Steve. "Eyehategod". Allmusic. Retrieved on 2008-06-22. ^ a b York, William. "Soilent Green". Allmusic. Retrieved on 2008-06-22. ^ a b Huey, Steve. "Crowbar". Allmusic. Retrieved on 2008-06-22. ^ a b Prato, Greg. "Down". Allmusic. Retrieved on 2008-06-22. ^ nola.com. "Nagin urges census revision". Retrieved on 2008-03-22. ^ Gibson, Campbell (June 1998). "Population Of The 100 Largest Cities And Other Urban Places In The United States: 1790 To 1990". Population Division, U.S. Bureau of the Census. Retrieved on 2006-05-02. ^ "American FactFinder". United States Census Bureau. Retrieved on 2008-01-31. ^ "Population estimates by parish". US Census Bureau. Retrieved on 2008-03-22. ^ "Expert: N.O. population at 273,000.". 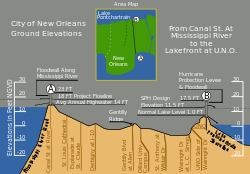 wwltv.com (2007-08-07). Retrieved on 2008-04-03. ^ "Mail survey shows N.O. population at 69 percent of Pre-Katrina.". wwltv.com (2007-09-27). Retrieved on 2008-04-03. ^ "Study Sees Increase in Illegal Hispanic Workers in New Orleans" (2006-06-08). Retrieved on 2008-03-31. ^ "New Orleans (Archdiocese) [Catholic-Hierarchy]". Retrieved on 2007-01-04. ^ New Orleans, "now under the flag of the United States, is still very much a Caribbean city...." "The Pearl of the Antilles and the Crescent City: Historic Maps of the Caribbean in the Latin American Library Map Collections". Latin American Library, Tulane University. Retrieved on 2007-01-04. ^ New Orleans is described as "a Caribbean city, an exuberant, semi-tropical city, perhaps the most hedonistic city in the United States". R.W. Apple, Jr.. "Apple's America" (quoted on ePodunk.com). Retrieved on 2007-01-04. 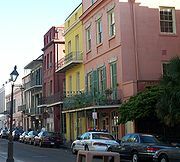 ^ New Orleans "is often called the northernmost Caribbean city". Kemp, John R. (1997-11-30). "When the painter met the Creoles", Boston Globe, p. G3. Retrieved on 2007-01-04. ^ "Newcomers' Incentive Extension". Jewish Federation of Greater New Orleans. Retrieved on 2008-03-22. ^ "Find a County". National Association of Counties. Retrieved on 2008-01-31. ^ "New Orleans murder rate on the rise again", MSNBC (2005-08-18). Retrieved on 2006-05-17. ^ After Katrina, New Orleans Crime Moves to Other Cities. ABC News, November 16, 2005. ^ a b Houston ties murder increase to Katrina. AP via MSNBC.com, October 21, 2006. ^ Drew, C. Drug Problems Escalate After Hurricane Katrina. The New York Times, August 5, 2006. ^ Nossiter, A. and C. Drew. In New Orleans, Dysfunction Fuels Cycle of Killing. The New York Times, February 5, 2007. ^ McCarthy, B. N.O. is murder capital for 2006. The Times Picayune, June 5, 2007. ^ Moore, Katie (November 15, 2007). "Statistics show city more violent than once thought". WWLTV. Retrieved on 2007-11-22. ^ "Howard-Tilton Memorial Library". Retrieved on 2006-05-17. ^ "Law Library of Louisiana". Louisiana Supreme Court. Retrieved on 2006-05-17. ^ "Earl K. Long Library". University of New Orleans. Retrieved on 2006-05-17. ^ "NOPL Branches". Hubbell Library. Retrieved on 2006-05-17. ^ "Louisiana Division, City Archives and Special Collections". New Orleans Public Library. Retrieved on 2006-05-17. ^ "Williams Research Center". Historic New Orleans Collection. Retrieved on 2006-05-17. ^ "Old US Mint". Louisiana State Museum. Retrieved on 2006-05-17. ^ Nielsen Reports 1.1% increase in U.S. Television Households for the 2006-2007 Season. Nielson Media Research, August 23, 2006. ^ "Consultant Studies New Orleans Rail Project--Moves Back into Area Office After Hurricane". Retrieved on 2008-03-22. ^ The Big Easy. From: The Phrase Finder. Retrieved November 12, 2007.